It’s May 2030. Sunidhi Parmesh of Madhya Pradesh’s Jhabua district heaves a sigh of relief as she prepares breakfast on induction stove and packs it for her daughters getting ready for school. They have scored well this year and a large part of the credit goes to the 500 Watt (W) rooftop solar panels and 3 kilo- watt hours (kWh) battery bank she and her husband, Mahesh, installed a few years ago through a bank loan. The system harvests and stores enough to supply round-the-clock power to all household appliances, including a refrigerator, a TV and an e-scooter. Sunidhi no longer trudges through the hillocks to collect firewood or waits for a cooking gas (LPG) refill. Her daughters study even after nightfall and can access internet anytime. Mahesh has also installed a solar water pump in his 2-acre (0.8 hectare) field for drip irrigation. Instead of paying hefty electricity and fuel bills, he now sells the excess solar power to a company—aggregator—in Delhi. There are 20 such aggregators across the national capital who now pool renewable electricity from individual households and advertise their green credentials to woo consumers. The two big electricity distribution companies (discoms) have shut shop. Instead, there is one company in each municipality to manage the distribution grid. With solar and wind becoming the cheapest sources of power, there are less takers for coal, and the Coal India Ltd (CIL) has started closing mines. Coal-based power plants now get paid by the government to be on stand-by. India revels in the democrati sation of energy as hundreds of thousands of households and businesses turn “prosumers”—they consume as well as produce electricity. To ensure universal access to basic electricity, the government offers subsidy to the poor through direct bank transfer, so that they can buy it from the aggregator of their choice. Cut to present. 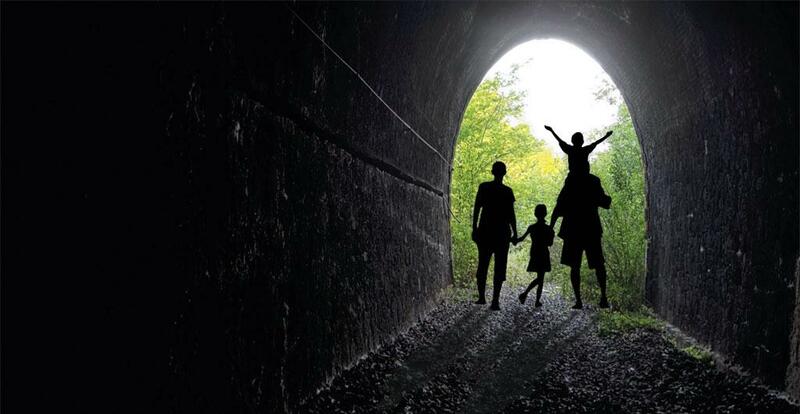 The government, with the target to connect 40 million households to the grid by December 2018 and curb rising electricity prices, is investing heavily in coal mines. It wants CIL, the state monopoly, to produce 1 billion tonnes of coal a year by 2019-20; up from 554 million tonnes in 2016-17. It is looking to open new mines in the untapped 5,100 sq km coal bearing lands. New gas pipelines are being laid to make LPG available to all. In addition, an ambitious scheme—Ujwal Discom Assurance Yojana (UDAY)—is being implemented to revive discoms operating in the red. While all these efforts portray a bright future, the fact is India is chasing a dream that is far removed from reality—the world is undergoing a massive energy transition. Over the next decades, there will be radical changes in the way we produce and consume energy. The conventional energy infrastructure being set up now would be abandoned even before their economic life is over. China is already experiencing this. Since 2010, China has added close to 300,000 megawatts (MW) of coal power capacity. Its current capacity is about 950,000 MW—over three times that of India. However, between 2011 and 2016, the average operation hours of its plants have reduced—from 5,305 hours of the 8,760 hours in a year to 4,165 hours. This means coal power plants in China operated at less than half their capacity in 2016. A report by Oxford University released in February 2017 estimates that investors in coal power may lose US $449-$1,047 billion because the assets would not be profitable to run or would be shut down due to environmental reasons. In the past five years, both the US Energy Information Administration (USEIA) and Inter national Energy Agency (IEA) have downgraded their forecast on coal consumption. In 2013, USEIA in the International Energy Outlook Report forecast some 33 per cent growth in the global coal consumption between 2010 and 2040. Its 2017 report forecasts stagnation in coal consumption between 2015 and 2050. 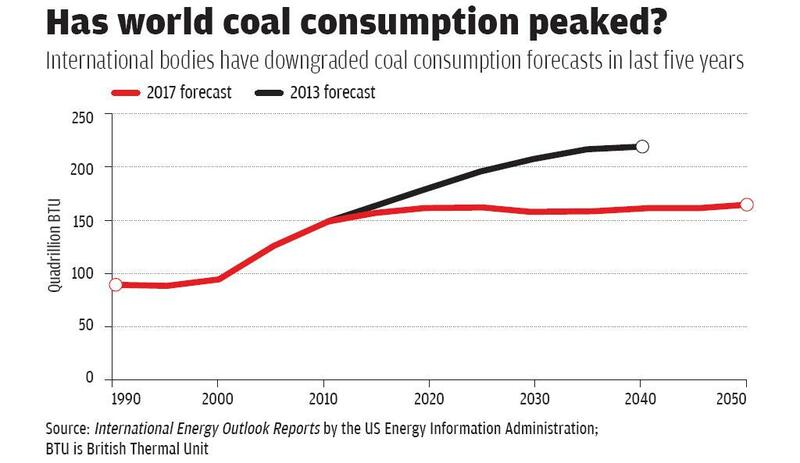 IEA in its 2016 World Energy Outlook Report also predicts a halt in the growth of global coal consumption till 2040. In 2012, it forecasts an 18 per cent growth in coal consumption during 2010-2035. So, what prompted this sudden change in the outlook of USEIA and IEA, which have consistently underestimated the growth of renewable energy. Analysing this would require one to have a thorough understanding of key forces that are influencing consumer behaviour and businesses worldwide, and thereby driving technological innovations. These driving forces reflect growing commitments across the world to achieve universal access to energy, growing demand for clean air and willingness to curb greenhouse gas emissions. “Ensure universal access to affordable, reliable and modern energy services by 2030.” This is the 7th Sustainable Development Goal of the UN. Never in the history has so much focus been put on providing universal access to energy, especially electricity. Globally, about 1 billion people do not have access to electricity. Ensuring electricity to them requires an investment of nearly $50 billion every year till 2030. This is about 2 per cent of the annual investments made in the energy sector. Though there is a significant gap in the investments required for universal electricity access by 2030, the scale and pace of investments has increased worldwide. Electricity access investments in top 20 countries increased from $18.7 billion to $20.1 billion in just one year, during 2013-2014. Countries like Bangladesh and Ethiopia are investing 2-3 per cent of their GDP to primarily finance electricity access. Increasing amount of international finance is also being directed to support energy access. Power Africa, the US government partnership with African governments to double electricity acc ess in Sub-Saharan Africa, has announced plans to invest up to $1 billion in Nigeria. International mechanisms like Africa Renewable Energy Initia tives have been put in place to provide electricity access through renewable energy. The bottomline is over the next 10-15 years, a large number of people will have access to electri city. India, which is home to the largest population without access to modern energy services—some 300 million do not have access to electricity and about half-a-billion primarily depend on polluting biomass for cooking and heating their homes—will have near-universal access. The government has just announced a multi-billion dollar initiative to provide electricity connection to all by 2018. All these will have huge implications on the investments we are making today. For instance, so far, clean cooking fuel has meant provision of LPG or clean biomass cook-stoves. With improving access to electricity and advan cements in safe and efficient electric cooking stoves, electricity will be the natural choice of cooking fuel. This is what happened when universal access to electricity was ensured in developed countries. In the past five years, poor air quality in cities has also attracted global attention. Deaths and diseases due to air pollution have cost the global economy more than $5.0 trillion annually. In India, the loss to GDP exceeds 5 per cent. To clean the air, local authorities are taking desperate measures. China has stopped constructing new coal power plants in polluted zones; Beijing now regularly shuts coal power plants. In India, for the first time, a power plant—Badarpur Thermal Power Station in Delhi—was closed to make air breathable during the winters. While Paris, Madrid, Athens and Mexico City have announced plans to ban diesel vehicles by 2025, India and China are planning large-scale introduction of electric vehicles. This momentum towards clean air is triggering seismic shifts in the power as well as transport sectors. This is the third but the most crucial driving force triggering changes in the energy infrastructure. The impact of climate change is hurting now, not only the poor but also the rich. The multiple hurricanes that have hit the US this year are estimated to have damaged hundreds of billions of dollars worth of property that will take many years to reconstruct. The simultaneous extreme rainfalls and droughts in India are hitting cities and villages alike. Heat wave fuelled forest fires are killing people in Europe and Asia. There is now an emerging consensus that action against climate change has to be taken now, and quickly. Despite US President Donald Trump withdra wing from the Paris Agreement and failure of coun tries to pledge significant emissions cuts in Paris, businesses and local governments are setting ambitious targets to tackle climate change. More than 75 of the world’s biggest cities, forming the C40 Cities Climate Leadership Group, have pledged to substantially reduce emissions over the next three decades. In September, six top apparel companies, including Gap, Nike and Levi Strauss, joined hands with more than 300 companies from the apparel sector that have pledged to set science-based climate targets—targets that are consistent with the aggressive emissions reduction pathways outlined by the Intergovernmental Panel on Clim ate Change (IPCC). The shift, though insufficient, is evident. In 2016, the world recorded the slowest increase in greenhouse gas (GHG) emissions since the early 1990s, except for global recession years. This is mainly due to two factors: lower coal consumption and increased generation of renewable power. In fact, global carbon emissions registered “almost no growth” from burning fossil fuels for the third consecutive year despite global economic growth exceeding 3 per cent a year. Technological innovations triggered by these driving forces are changing the way we know the energy sector. Here are five technological trends that are set to herald the massive energy transition worldwide. India will be heavily impacted by these as it has huge potential to leapfrog to a cleaner future. TREND 1 | Rapid decline in renewable energy prices: The prices of solar photovoltaic (PV) plants have plummeted in the past six years. According to the International Renewable Energy Agency (IRENA), PV module prices declined by 80 per cent between the end of 2009 and the end of 2015. 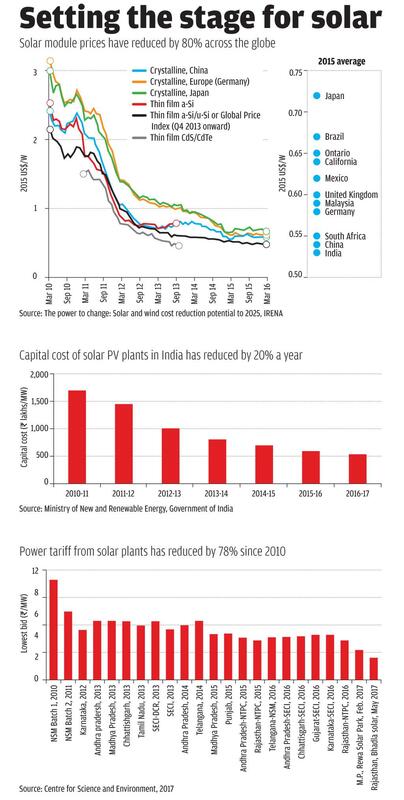 In India, the capital cost of solar PV plants reduced by 20 per cent annually between 2010 and 2016. Consequently, the cost of electricity from utility-scale (large) solar power plants nose-dived from Rs 12/kWh in December 2010 to less than Rs 2.5/ kWh in May 2017. At present, the cost of solar power is 20 per cent less than the average price NTPC Ltd, India’s largest power generation utility, charges for the power generated by its coal-fuelled projects. Wind power has also got cheaper, though the decline is not as dramatic as that of solar power. Globally, the weighted average capital cost of onshore wind has declined from $4,766/kW in 1983 to $1,560/kW in 2015, a reduction of two-thirds. Today, the lowest installed cost of wind power is in India and China. The wind power tariff in India also hit a record low of Rs 3.46/kWh in February 2017 during a 1,000 MW bid by Solar Energy Corporation of India (SECI). This is cheaper than the power generated from coal plants using imported coal. In the latest 1,000 MW bid for wind power floated by SECI, the tariff is projected to reach Rs 3.3/kWh. These tariffs are projected to hit new low in the next 10 years. According to IRENA, from 2015 levels, the global weighted average tariff of solar PV could fall by as much as 59 per cent by 2025; onshore wind power tariff could fall by 26 per cent. TREND 2 | Battery gets efficient, affordable: In October 2016, Elon Musk of Tesla unveiled his Powerwall 2, a stack of Lithiumion batteries that can store 14 kWh of electricity and last for over 15 years. Along with solar panels, the Powerwall has been designed to make homes go off-grid. Today, a typical upper-middle class family in India can go off-grid by buying two Powerwalls online at $12,400 (about Rs 8 lakh) and a 10 kW solar rooftop plant costing about Rs 6 lakh. The total cost of going off-grid today is equal to buying a mid-range car. In December 2016, Tesla installed a grid-connected battery storage facility for Southern California Edison, the electricity supply company for much of Southern California. The 80 MWh battery stores electricity when the demand is low and then feeds it back into the grid at peak hours. Earlier, this used to be done by gas-fired power plants. Tesla is now building a 129 MWh battery storage for South Australia to store electricity from wind farms and supply it at a steady rate to consumers. Tesla is not alone; many more compa nies are investing in grid-scale battery storage with investment reaching $1 billion in 2016. Back home in India, pilot projects are underway on grid-connected battery storage system. In Puducherry, three technologies—advanced lead acid, lithiumion and alkaline flow battery—are being tested for keeping the grid stable and to facilitate integration of renewables by storing energy during the daytime and using it during night. A 1,400 kWh Giga-Capacitor-based energy storage system is under operation in Hyderabad. Giga-Capacitor is a high voltage capacitor designed to store electrical energy electrostatically. The examples show that today we have batteries that can store electricity at utility scale and act both as a large base-load plant (like a coal-fired power plant that continuously supplies a constant amount of electricity) as well as a peaking plant (like a gas-fired power plant that can start immediately and provide instantaneous peaking power). And these batteries are improving at the rate of knots. The battery of the future will store more power, charge and discharge rapidly, be more stable and safe, and, most importantly, be cheaper by 70-80 per cent from today’s batteries. The price of batteries is tumbling. Lithiumion prices have dipped by over 50 per cent since 2010. According to a report by KPMG, the storage cost of Lithiumion battery in India is likely to fall from Rs 12.6/kWh now to Rs 3.5/kWh by 2025. With Rs 3.5/kWh as storage cost and Rs 3/kWh as generation cost from a solar rooftop plant, an average household in India can go off-grid in 2025. This is because in 2025, a household with solar rooftop coupled with battery storage will pay Rs 6/kWh compared to Rs 7 charged by discoms. TREND 3 | Houses, household appliances become super-efficient: More than 80 countries, which account for most of the global energy consumption, have set energy efficiency standards and labelling (EESL) programmes for appliances and vehicles. The coverage of mandatory energy efficiency regulations in industry, buildings and transport has nearly doubled, rising from 14 per cent of the world’s energy consumption in 2005 to 27 per cent in 2015. According to IEA, energy efficiency impro vements helped restrain the growth in final energy demand of the world to just one-third of the level it would otherwise have been. The momentum towards energy efficiency is such that despite significant reduction in energy prices in 2016, investments in energy efficiency increased that year. According to USEIA, the trend in energy efficiency improvements would continue and contribute significantly to the reduction in the global energy intensity. Even with doubling of per capita GDP and 25 per cent increase in global population, the global energy consumption is projected to increase only by 28 per cent in 2040 compared to 2015 levels. Consequently, the energy intensity of GDP (amount of energy consumed to produce $1000 GDP) is projected to reduce by half during this period. The fact is there has been a silent revolution in energy efficiency of most domestic appliances, which has improved by a factor of six to eight in last 30 years. In the 1990s, an incandescent bulb consumed 60 W and a ceiling fan consumed 150 W. Today, we have LED bulbs, which consume 7 W and last up to 20 times longer than incandescent bulbs, and fans that consume 25 W. In the 1980s, a 24-inch CRT TV consumed 150 W. Today, a similar size LED TV runs on 24 W. The energy efficiency ratio of an AC has increased from 1 British Thermal Unit (BTU) per Watt in the early 1990s to 7 BTU/W and above. Similarly, the energy efficiency of a fridge has improved six times. We are entering an era of super-efficient appliances. With large-scale installation of solar PV and proliferation of distributed generation, such as solar mini-grids in rural areas and solar rooftops in urban, DC appliances with double the efficiency of AC appliances will become mainstream in a decade. Similarly, it is possible today to build commer cial and residential buildings that consume 70 per cent less energy than the conventional building, with a payback period of less than five years. The 2017 version of Energy Conservation Building Code (ECBC) already mandates at least 25 per cent energy savings in new commercial buildings and has provided a roadmap for buildings to achieve the Super ECBC status by saving 50 per cent energy. By making ECBC mandatory for all building classes and further strengthening the star rating programme for appliances, India can easily improve the efficiency of buildings by a factor of three by 2030. TREND 4 | Electricity becomes prime mover: Globally only 21 per cent of the final energy is consumed in the form of electricity. Direct use of fuels like oil, gas, coal and biomass contribute the remaining 79 per cent of the final energy. These fuels are used in transport, industry and in buildings for heating and cooking. Today, we have technologies that can eliminate direct use of these fuels and replace those with electricity in practically all sectors, other than aviation, ships, heavy duty road transport and industries like cement, iron and steel, fertiliser and petrochemicals. According to IEA, the world’s demand for electricity would grow by 70 per cent between 2014 and 2040, and, more than half of the demand will be met by renewables. In 2016, for the first time, the electricity sector edged ahead of the oil and gas sector to become the largest recipient of energy investment. This is largely because the market anticipates quick shift to electricity in certain sectors. Though transition in the industry would take longer, the two sectors where transition from fuels to electricity will happen quickly are electric personal vehicles and induction cooking. Almost every major automobile company in the world has either introduced or has plans to introduce electric cars in the near future. And, all this has happened in the last few years. First, China made a big move towards e-vehicles: 750,000 electric cars were sold in 2016, taking the electric car stock to over 2 million; 40 per cent of those were sold in China. Recently, India has announced its plan to “bulldoze” petrol and diesel vehicles with e-vehicles by 2030. According to IEA’s Global EV Outlook 2017, the number of e-vehicles on the road will increase to 40-70 million by 2025. However, some automobile analysts are more bullish and predict that one in every three cars sold by 2030 would be electric. Electric two-wheelers have got a head start over electric cars. China alone has 200 million electric two-wheelers; India has 0.5 million. But, all major two-wheeler companies in the country are coming out with new models of electric two-wheelers. As per the target set by the Faster Adoption and Manufacturing of hybrid and Electric vehicles (FAME) scheme of the government, India should have 25 million electric two-wheelers by 2020. Most industry analysts believe the target can be reached by 2025 if incentives are properly targeted. Similar to rapid growth in e-vehicles, induction cooking is likely to grow rapidly. Induction cooking has emerged as the most efficient and cheapest method of cooking. Today, a single-stove induction stove is available at less than Rs 2,000. A family of five can reduce their cooking fuel bill by at least 30 per cent compared to LPG by shifting to induction cooking. 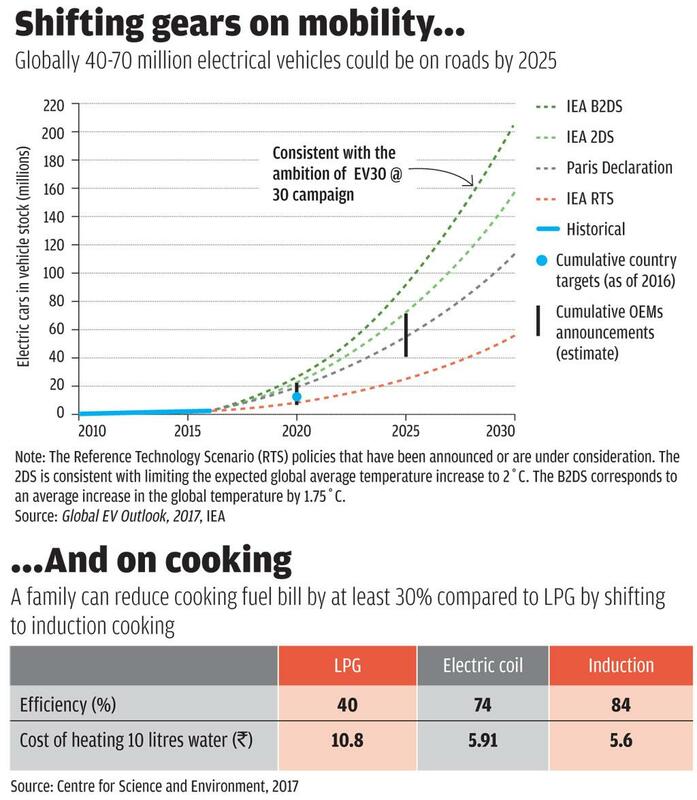 Should India leapfrog from dirty solid cooking fuel to induction cooking or should it invest in building LPG infrastructure? This is an important question for the government, spending billions of dollars to provide universal access to electricity. TREND 5 | Smart grids take over: A smart grid is an electricity network that uses digital and other advanced technologies for managing and real-time monitoring of electricity from all sources, especially renewable energy, to meet varying electricity demands of end-users. Smart grid allows the grid to become bi-directional and thus promotes consumers to become sellers, enables greater penetration of renewable energy and supports efficient demand side management, including enabling suppliers to charge different tariff of electricity at different time of the day (Time-of-Day tariff) to reflect demand and supply. The market size of smart grid is estimated to be $220 billion by 2020 and $500 billion by 2030. Many countries are already piloting smart grids or moving towards smart grids. In India, the work on smart grids started in 2010 with the constitution of India Smart Grid Task Force (ISGTF) and the India Smart Grid Forum (ISGF). ISGTF is an inter-ministerial group to provide policy direction. ISGF is a non-profit voluntary consortium of public and private stakeholders to accelerate development of smart grid technologies. In 2015, the government launched the National Smart Grid Mission (NSGM) with a budgetary support of Rs 338 crore. The Ministry of Power (MoP) has sanctioned 11 pilot projects across the country with different functionalities of smart grid. In addition, under UDAY scheme, smart meters are being installed for larger consumers at the feeder, distribution and transformer levels. India is looking at the smart grid not only from the perspective of integrating renewable energy, but also from the perspective of solving some of the fundamental problems at the distribution level, such as high transmission and distribution losses, power theft, frequent load-shedding and low voltage. Smart grid technologies allow many of these problems to be solved. For instance, Smart Meters and Advanced Metering Infrastructure are likely to reduce theft and improve billing at the consumer and distribution transformer levels. Substation renovation will improve the quality of power supply. So, in short term, smart grid will help discoms improve the quality of services and reduce losses. But in the long term, it will pave the way for unbundling of the distribution sector and thus lead to the demise of large discoms. The five technological trends will have a profound impact on the very architecture of the energy system in India. Let’s look at two fundamental impacts: end of coal and end of large integrated discoms. In mid-January 2017, strange news appeared in almost all major newspapers: India does not need new coal power plants till 2027, other than the 50 GW capacity under construction. This was announced by the Central Electricity Authority (CEA), the country’s main electricity planning authority. Any talk about slowdown was a heresy till a few years back. Projections were made for the need of new coal mines to produce 1.5 billion tonnes of coal by 2020, largely for power generation. A study by Delhi-based Centre for Science and Environment shows during 2007-2012, environment clearance was awarded to 220,000 MW worth of coal power plants and there was a frenzy to get more plants cleared. So, what happened to all these proposed plants? What has led to this turnaround? 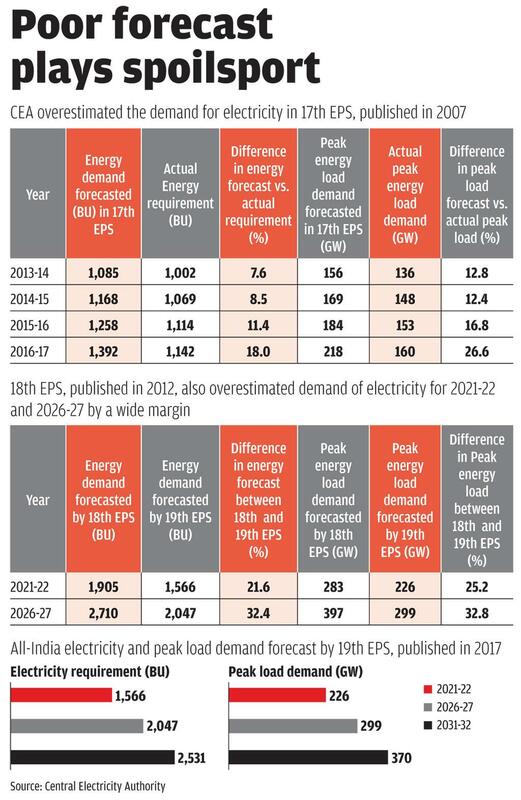 CEA’s poor forecasts on electricity demand and how they would be met is responsible for this turnaround. CEA has consistently forecast very high growth rate in the electricity demand in its Electric Power Survey (EPS) that never materialised. EPS is published every five years and charts the roadmap for growth in the sector. The result of the overestimation by EPS resulted in overcapacity in the coal power sector. In addition, CEA has traditionally downplayed renewable energy till the present government announced a target to install 175 GW of renewable energy by 2022. The implications of higher demand forecast has been that during the 12th Five Year Plan (2012-17), capacity of 99,209 MW was commissioned against a target of 88,537 MW from conventional sources. It is for the first time in the history of the Indian power sector that 112 per cent of the target was achieved. If we add the renewable energy installed during 12th Plan, then in April 2017, India had 327 GW of installed capacity against a peak demand of 160 GW. Consequently, the coal-based power plants operated at a plant load factor (PLF) of 60 per cent—this means they operated at just 60 per cent of their capacity. The PLF of coal power sector is not likely to improve if we compare electricity demand over the next 10 years and the capacity of existing power plants as well as those under construction and in the pipeline, especially solar and wind plants. 2021-22 | PLF of coal power sector reduces further: According to the latest 19th EPS published in 2017, the projected electricity requirement and peak demand for the entire country for 2021-22 is about 1,566 billion units or Billion kWh (BU) and 226 GW. For 2026-27, the projected electricity requirement is 2,047 BU and the projected peak demand is 299 GW. The annual growth rate in electricity requirement in the next 10 years is forecast to be 6 per cent, similar to the growth experienced in the past 10 years. During 2017-22, about 50 GW worth of new coal-based power is likely to be commissioned. By March 2022, 2,800 MW of nuclear reactors will be commissioned. About 15 GW of hydropower plants are likely to come on-stream by 2021-22. About 4 GW of gas-based power plants are likely to be commissioned by 2022. India has set a target to install 175 GW of renewable energy by 2021-22. As 57 GW was already installed till 2016-17, an additional 118 GW needs to be installed in the next five years to meet the target. But this target is not likely to be met due to regulatory and market issues. Instead 125 GW installation of renewable by 2022 is realistic. So, India will install only 70 GW between 2017 and 2022. If all these plants are commissioned, then the projected installed capacity by March 2022 is likely to be 470 GW. This is more than enough to meet the electricity requirement and peak load requirement for 2021-22. In fact, the PLF of coal power plants will reduce to 50 per cent in 2021-22. In other words, India will have far more installed capacity than actual electricity demand by 2021-22. But what will happen in 2026-27? Will India meet its electricity demand in 2026-27 with whatever capacity it has in 2021-22? 2026-27 | Installed capacity of non-fossil fuels exceeds fossil: According to CEA’s projections, the momentum in the renewable energy sector will lead to an addition of another 100 GW renewable power capacity between 2021-22 and 2026-27. CEA also projects installation of 12 GW hydropower capacity during 2022-2027. In addition, 4.8 GW capacity nuclear plants are likely to be commissioned by 2026-27. CEA’s modelling shows that if these capacities come on-stream, India will not need to install any coal or gas based power plants during 2022-2027. 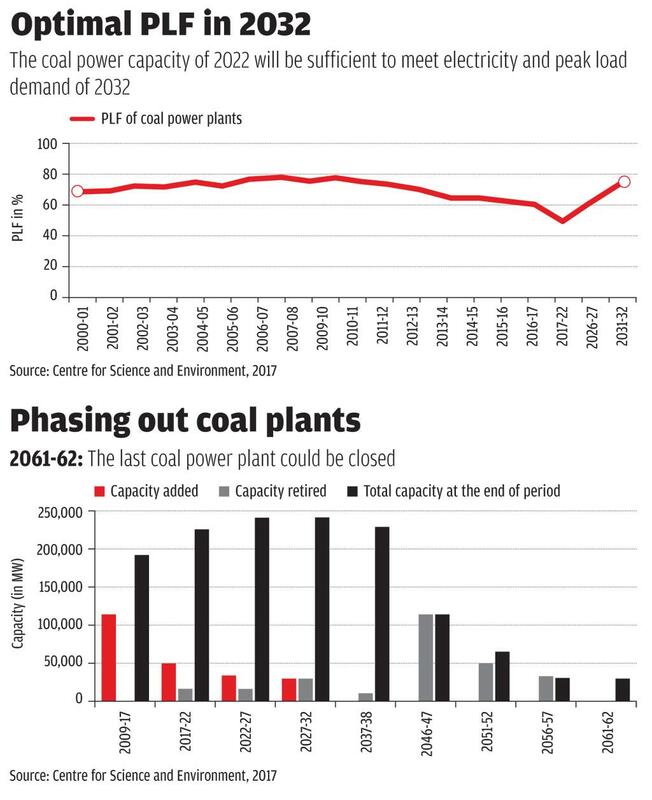 The coal capacity existing in 2021-22 would be more than sufficient to meet energy and peak load demand in 2026-27. In fact, PLF of coal power plants in 2026-27 will reach barely 60 per cent. In 2026-27, for the first time, the installed capacity of non-fossil fuels will exceed fossil fuels. Coal and gas will contribute only 46.5 per cent of the installed capacity. The remaining will be from renewables, hydropower and nuclear. Still in 2026-27, 65 per cent of the electricity will be generated from coal- and gas-based power plants. The remaining will come from non-fossil fuels; about 16.5 per cent of the generation will come from solar and wind plants. 2031-32 | Final straw on coal power plants: The world after 2026-27 will belong to renewable energy. During 2017-27, for every 1 MW of coal capacity addition, India is projected to install at least 3 MW of solar and wind power capacity. By 2026-27, wind and solar power, not coal-based power, will dominate the energy sector. So, will India need new coal power plants post-2027? This depends on two factors: one, cost competitiveness of coal power plants vis-à-vis renewable energy projects, and two, sufficiency of coal power capacity of 2027 to meet the requirements of 2032. As illustrated in the beginning, solar and wind will be the cheapest sources of electricity for a consumer in India in 2025. Large solar and wind plants with partial storage and rooftop solar plants with full storage will compete with coal and gas power plants. So, economically there is no rational to install new coal power plant. But what about the technical requirement of the grid? 19th EPS projects a 4.3 per cent annual growth in electricity requirement and 4.4 per cent growth in peak load requirement between 2027 and 2032. The peak load demand in 2031-32 is projected to be 370 GW and electricity requirement is 2,531 BU. For the sake of grid stability, if we assume that the proportion of electricity produced from various sources in 2026-27 remains the same in 2031-32, then about 1,560 BU of electricity will have to be produced from coal power plants in 2031-32. It will be possible to produce this electricity even with 242 GW of coal power plants existing in 2026-27. The only change will be that PLF of plants will increase from 62 per cent in 2027 to 74 per cent in 2032. This is a most desirable outcome, as 75 per cent PLF is considered optimal. So, neither India will have to install coal power plants between 2022-27, as predicted by CEA, nor will the country have to construct additional coal power plants during 2027-32. This means, the coal power plants operational and being constructed today will easily meet our electricity requirements till 2032. After 2032, India will not need to set up new coal power plants as setting it up would become expensive compared to new solar or wind plant coupled with full storage. As coal plants will have the highest PLF in 2032, coal consumption in 2032 will be the highest and then start reducing. Assuming that 0.65 kg of coal is required to produce 1 kWh, in 2031-32 India will consume about 1 billion tonnes of coal in the power sector. So, India’s coal consumption for power will peak at 1 billion tonnes by 2031-32 and then start reducing. If we assume economic life of coal power plants as 30 years (MoP assumes it as 25 years), then it is possible to phase out most coal power plants by 2050 and replace them with non-fossil fuel plants. Below is a possible scenario of how this phase out will happen. In this scenario, by 2056-57, India’s coal power capacity will be 30 GW—one-sixth of the current capacity—and then the last coal power plant can be closed by 2061-62. As one can see that post-2022, some new coal power plants will have to be installed, but they are not additional capacity. They will be installed to replace old power plants. If we assume economic life of coal plants as 25 years, the last coal plant could be closed in 2050. Uttar Pradesh Power Corporation Ltd (UPPCL) is responsible for the transmission and distribution of electricity to 200 million people in the state. It manages transmission infrastructure of about 30,000 circuit (ckt) km and distribution infrastructure of more than 40,000 ckt km; serves 16.5 million consumers and supplies 45,000 MW of electricity. It is losing around Rs 8,000 crore each year. UPPCL is a classic case of big integrated discoms that are all set to shut shop because of technological advancements. The discoms in India are bankrupt and surviving on sops from the government. The latest comprehensive data for all discoms is available for 2014-15. That year, discoms incurred loss of Rs 1 lakh crore. They had a total outstanding debt of Rs 4.07 lakh crore and their net worth was in minus Rs 2.43 lakh crore. The Aggregate Technical & Commercial losses today stand at 25 per cent. The important issue to consider is that states with a high renewable energy potential and target have discoms in poor financial health. 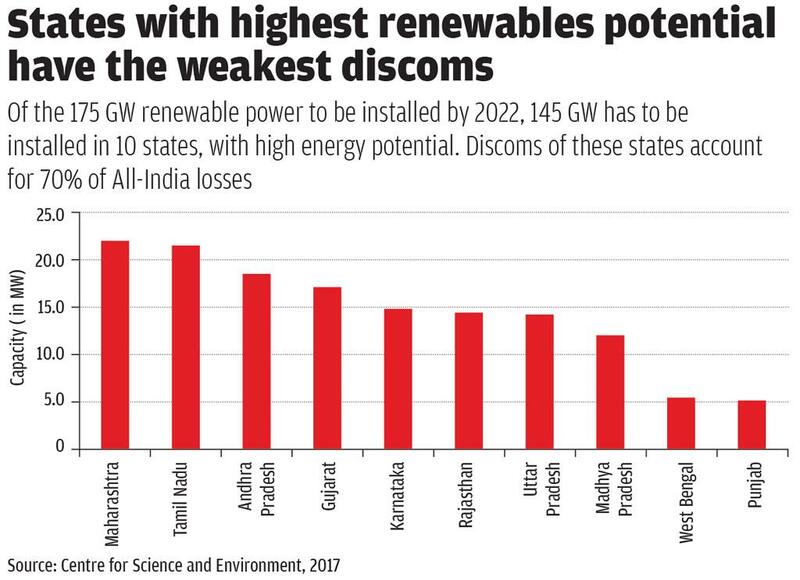 If we consider the target for 2022 set by the Ministry of New and Renewable Energy (MoNRE), then most of the renewable power—83 per cent of the 175 GW—has to be installed in 10 states. These top 10 states account for the lion’s share of poor balance sheet of discoms in India. About 72 per cent of the total losses in 2014-15 and 73.5 per cent of the accumulated losses were accounted by the discoms of these states. About 80 per cent of the total outstanding debt was accounted by the discoms of these 10 states. Large-scale penetration of renewable power will make their discoms even more unviable. According to a report by renewable energy consultancy firm Bridge To India, the tariff charged to commercial and industrial consumers by these discoms is so high that currently it is viable for these consumers to shift to solar rooftop during the daytime. By 2020, in all states solar rooftop will be the cheapest source of power for commercial and industrial consumers. 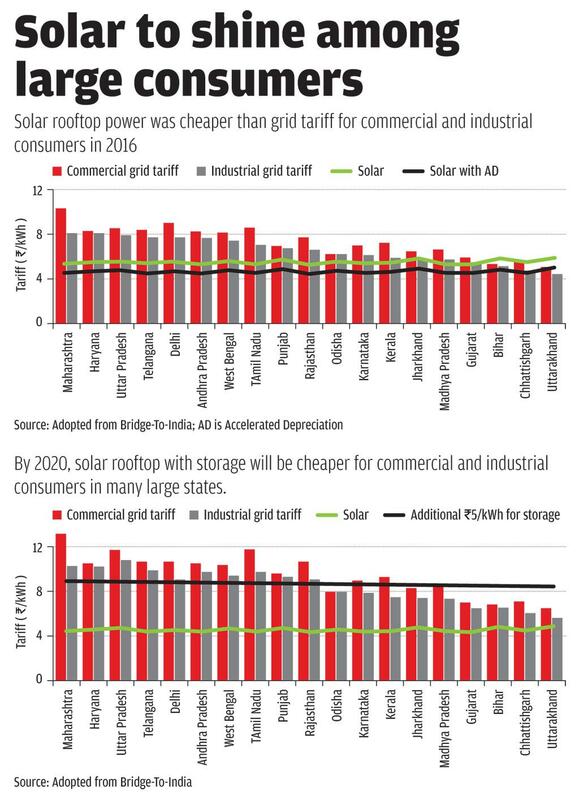 In fact, in 2020 in all major states like Maharshtra, Uttar Pradesh, Delhi and Andhra Pradesh, solar rooftops with storage will be cheaper than grid tariff for commercial and industrial consumers. These high-paying consumers are likely to move to solar rooftops, putting pressure on the finances of discoms. In fact, open access based on renewable energy is going to be even a bigger threat. Under the Electricity Act of 2003, a consumer with a connected load of 1 MW and above can buy power from the open market and not from discoms. They have to pay for using the grid. An open access consumer can also install dedicated mega-watt scale renewable energy project off site and use the grid to consume that power. According to a report titled “India’s journey towards 175 GW Renewables by 2022”, published by the Prayas Energy Group in 2016, the cost of solar power through open access in various states is already cheaper than their utility tariffs for commercial and industrial consumers. The open access along with reducing cost of solar energy and storage technology is likely to be a game-changer in future. It is possible that within a decade, high-paying consumers (including gated communities) would start moving away from discoms and set up their own or have some other entity set up renewable energy projects with electricity storage facility to enable 24x7 power supply. They will use grid and local distribution network as a transmission platform and pay charges to the grid operator for transmitting that power. Once this happens, it will make discoms unviable. Large consumers will move to large decen tralised projects and small consumers towards solar rooftops and building integrated systems. A renewable energy world, therefore, will require separate transmission and distribution operators to build and operate grid infrastructure. The job of the distribution company, like trans mission companies, is to maintain the distribution infrastructure and charge for using it. Any produ cer, trader or aggregator should be able to use the transmission and distribution infrastructure and provide power to consumers. The unbundling of electricity sector along with smart grid will revolutionise the way we produce and consume electricity. We will have hundreds of thousands of “prosumers” who will buy and sell power, thousands of mini-grids and millions of off-grid homes. Similar to Germany, renewable energy capacity would be owned by citizens, panchayats, cooperatives, factories and commercial establishments and not big utilities. Virtual power companies would emerge. They will collect power generated from individual rooftops and renewable power plants and sell to other consumers. They will have no asset of their own. This will be the “Uber model” in the electricity sector. Energy storage companies will also emerge who will install big utility-scale electricity storage devices and provide electricity to the grid for balancing, peaking and even base-load requirement. The energy efficiency market will also become big with Energy Efficiency Service Companies selling efficiency products to consumers. And, these Energy Service Companies will sell energy services like lighting, heating and cooling, not electricity. Once this happens, we will live in a world of watts and not kilowatts as super-efficient appliances would become a norm. As e-vehicles would be the biggest segment of the automobile sector, building and vehicles would be integrated. The current petrol pumps would get transformed into electric power charging companies as batteries would get charged in less than 10 minutes. As distributed generation would proliferate, more and more electricity would be consumed onsite with surplus flowing into the grid. Grid of tomorrow will be like the internet of today. In the above world, we will have some large utilities (even fossil fuel based), but they will be on stand-by for balancing loads. They will be flexible. They would get capacity charge (feed-in-tariff) to remain on stand-by. But what will happen to the poor? If the rich move out of the centralised distribution system, who will cross-subsidise the poor? The answer is that the rich will cross-subsidise the operations of the grid and the distribution network. As they will use these infrastructure, they should be charged higher to cross-subsidise the poor. As far as electricity is concerned, the government can provide direct subsidy to the poor to provide minimum electricity need. This is the only way India can decarbonise the electricity sector and provide energy access to all. But is government envisioning and planning for this future? The answer is no. Talking about “end of coal” is a taboo. Predicting demise of large discoms is considered absurd. But the fact is that the government is putting in places policies and plans—though in a fragmented manner—that can end coal in the 2050s and unbundle distribution sector even much earlier. The government is aggressively promoting large renewables and decentralised renewables. Net metering policy is practically in place for solar rooftop in all states. Open access is allowed but is being resisted by discoms. The government has also put in place an ambitious plan for e-vehicles that will have huge implications on the transport sector and on the economics of batteries. It is promoting star rating for energy efficiency in appliances and buildings; though it needs to be more aggressive on this. It is investing in smart grid and meters. And, the politics of the day demands that access to electricity is provided to all, at the soonnest. If all the reforms are put together, the world of Sunidhi of Madhya Pradesh’s Jhabua district will become real in 2030.